¶ 3 Leave a comment on paragraph 3 0 Almost everybody is familiar with at least a few lines from Dylan’s songs: “You don’t need a weatherman to know which way the wind blows”…… “The answer is blowing in the wind”……. “May you stay, forever young”……..“Don’t criticize what you don’t understand”.. But the most well-known has to be“the times they are a’changin’”. Quotations from the song turn up everywhere: on TV, radios, books, magazines, and newspapers. ¶ 4 Leave a comment on paragraph 4 0 Like Blowin’ in the Wind, Times spoke to an entire generation of people who grew-up in the sixties. Unlike most other politically aware songs, Times has lasted for several generations. ¶ 5 Leave a comment on paragraph 5 0 There are at least a couple reasons why this song is still relevant. First, unlike most protest materials Times is very non-specific: no actual events or people are mentioned. For that reason, the song doesn’t age as the events or people fade from memory. Second, the sentiments expressed in the song are universal and can be applied to any political or social movement. ¶ 7 Leave a comment on paragraph 7 0 This was definitely a song with a purpose. I knew exactly what I wanted to say and for whom I wanted to say it. I wanted to write a big song, some kind of theme song, ya know, with short concise verses that piled up on each other in a hypnotic way. ¶ 8 Leave a comment on paragraph 8 0 The structure of the song is based on old Irish/Scot ballads, as Dylan acknowledges in the booklet included with the Biograph collection. Old ballads frequently use the same “Come all ye” and “gather round folks” phrases that Dylan uses in Times. A familiar example is “Come All Ye Fair and Tender Maidens”. ¶ 9 Leave a comment on paragraph 9 0 Listen to David Bromberg sing it. ¶ 11 Leave a comment on paragraph 11 0 Times is steeped in religious imagery. Dylan biographer Robert Shelton suggests a connection with Revelations 1:3. ¶ 12 Leave a comment on paragraph 12 0 Blessed is he that readeth, and they that hear the words of this prophecy, and keep those things which are written therein: for the time is at hand. ¶ 14 Leave a comment on paragraph 14 0 But many who are first will be last, and many who are last will be first. ¶ 19 Leave a comment on paragraph 19 0 This album contains a number of Dylan’s weaker performances. The performance of Times, however, is right on. Although his guitar playing is bit unsteady at times, Dylan really nails it. He clearly enunciates the words and suffuses the song just the right amount of urgency. ¶ 20 Leave a comment on paragraph 20 0 One criticism often leveled at Dylan is that he is the prophet of doom and apocalypse, the master of gloom. However, this song – just like Blowin’ and Hard Rain – is not a forecast of unmitigated and unavoidable suffering. Re-read the lyrics. Although each of these songs warns of impeding danger, each also predicts a brighter future and spurs the listener on to go out and work for a better ending. Contrary to popular belief – which is perhaps caused by the sullenness Dylan often exhibits in interviews and TV appearances – Dylan’s work is not nearly as bleak as it is often portrayed. ¶ 21 Leave a comment on paragraph 21 0 Dylan has, of course, performed Times many times over the years. An alternate version was released as an extra on the 2001 Love and Theft recording. Why I don’t know, since there’s nothing especially noteworthy about it. He slows the song down slightly, and the phrase “rattle your walls” is sung “vibrate your walls”. There is a version on At Budokan with some unnecessary backing vocals. 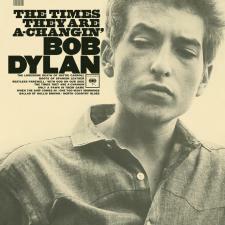 In other versions, such as on the MTV Unplugged video, Dylan slows the song down even more, which adds a tint of fatigue and regret to the lyric. These versions are all fine, but the original is still the best. ¶ 23 Leave a comment on paragraph 23 0 From the alternate “Hard Ran” TV special. ¶ 25 Leave a comment on paragraph 25 0 Duet with Baez, Rolling Thunder tour. ¶ 27 Leave a comment on paragraph 27 0 From Bootleg Series, piano version.